We celebrate interdependence this Independence Day in Congo with Marijane, Chanceline, and Martine, who started a sewing co-op after graduating @Action Kivu’s Sewing Workshop in 2015. Using the machines they received upon graduation thanks to a generous donation from Robin Wright and Karen Fowler’s Pour Les Femmes that year, the three women say that when they work on each order together, they finish faster, allowing them to take more orders per month. We love to work together, and this is something we learned from the Sewing Workshop program. We are working, we are strong. Since I graduated, I feel completely different. I have a voice. I pay for my child’s school fees each month. This year we need your help to graduate the Class of 2017. And we know, from statistics and from the stories of our alumni, that when you invest in women’s education and vocational training, you invest in their children’s future, and the health of the community. Take action: Invest in the future of Congo today! Celebrating, the women held high their graduation certificates, sang songs of gratitude, and made plans for their new small business ventures as designers and seamstresses. It was Action Kivu‘s Sewing Workshop graduation day for 60 girls and women in a village in eastern Congo, a day made possible by pajamas, you, and Robin Wright! Robin watched the video (below) of the graduates celebrating and sharing their stories of how their lives have been changed by learning to sew and starting small businesses, and sent this message to the women. “Mama Robin,” as many of the Congolese women who met Wright on her 2011 trip to the Democratic Republic of Congo call the actor, is a vocal activist on behalf of the people of Congo. Late last year, Robin partnered with her friend and fashion designer Karen Fowler to create a campaign for the women of Congo through Pour Les Femmes, a luxury pajama company. The profits from the PJ sales traveled 15,114 kilometers from Los Angeles to Congo, and purchased sewing kits for these women to start their own businesses, earning income to feed, clothe, and send their kids to school, helping to break the cycle of poverty and change the landscape of their lives. Some women walked one kilometer, some trekked five or six, a few bused in from the city of Bukavu, braving the unpaved dirt roads made muddy and dangerous from two days of the non-stop, rainy season wet weather. It’s just this wet weather that makes travel in Congo so dangerous, yet also makes it look a lush, verdant paradise, with its rolling green fields and the wide leaves of banana trees leading up to the misty mountains surrounding the valley. But the potential for paradise in Congo has long been marred by conflict, extreme poverty, and violence against women as a weapon of war. 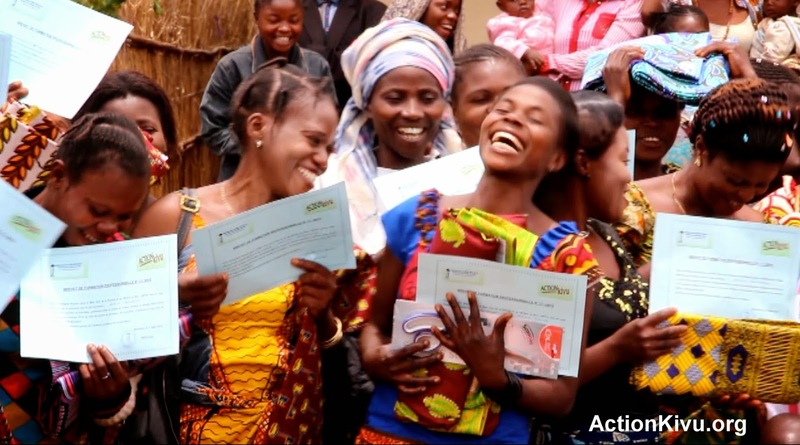 That Saturday in March, in a corner of Congo, a country in which it is reported that 2.5 million girls are out of school, 60 young women ages 14 to 28 made their way to celebrate graduation from Action Kivu’s 8-month sewing program. They walked through the rain to the Mumosho Women’s Center, the heart of Action Kivu’s work in Congo. Amani Matabaro is the man and the inspiration behind Action Kivu. In 2006, Amani and his wife created Action Kivu’s partner organization in eastern Congo, Actions pour le Bien être de la Femme et de l’Enfant au Kivu (ABFEK), after learning that his cousins, victims of the ongoing conflict, needed work and a place to live. At the March 2015 graduation, Amani congratulated each seamstress for her diligence in learning a new skill and gaining an education, invoking empowerment that no one could take away from them. Often overwhelmed by tears of joy, Amani handed each woman her certificate of completion, and draped her new tape measure around her bowed head, a sort of sewing stole denoting achievement in education. Each woman received her graduation kit: a push-pedal sewing machine (for working in villages with little or no electricity), fabric, a box of threads, scissors, and her tape measure. The rain abated, and the women stepped outside to pose for photos and share their stories of how learning to sew and having the means to earn income has already changed their lives. “I am the happiest person on the planet today because of this graduation kit, I had never expected this, I waited for a long time but today is the day,” said Cibalonza Claudine, the sewing program’s star student, who was wearing a dress she had made. Cibalonza walks an hour and a half each way to attend the sewing classes at the Center, and was never late, never missed a session, said Amani. Action Kivu’s work in Congo provides women with a variety of entrepreneurial programs to create sustainable change in their community, from bread baking and basket making to the sewing workshops, from literacy classes to a demonstration farm for growing food to sell and eat, as well as education assistance for the kids in the community whose families cannot afford to send them to school. Your partnership through Action Kivu, whether an annual gift or a monthly donation, changes lives. These women, who have so little in terms of money, power, or influence, have so much to teach us. Their gratitude for what you give them to start them on their path to earning income and caring for their families, reminds us of our connection to everyone in the world. 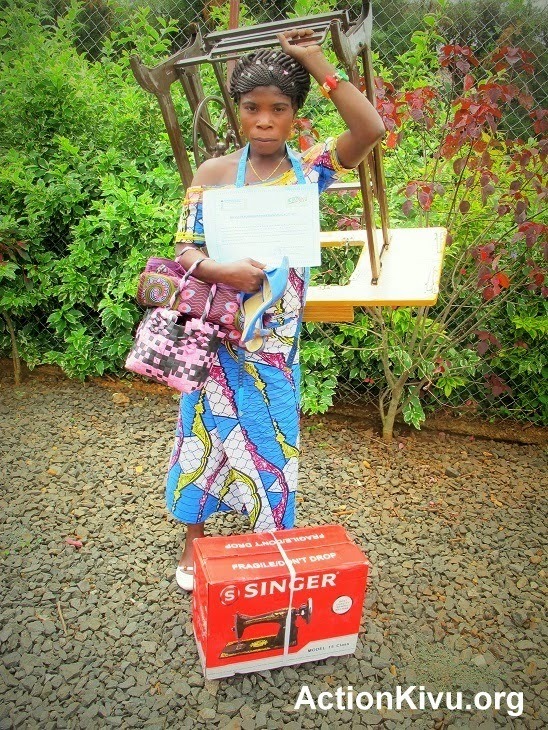 Thank you for partnering with Action Kivu through the Pour Les Femmes campaign! Please consider continuing your partnership with Action Kivu — it provides the means to continue these life-changing programs for the women and children of Congo. All donations are tax deductible in the U.S., and make a tangible difference in the lives of these women, as they share, in the video above. ABFEK is registered as a local non-governmental organization in the Democratic Republic of the Congo. Action Kivu, Inc. is a registered 501(c)(3) charity in the United States. Our EIN is 27-3537799. Robin Wright Launches Sleepwear Line to Benefit Women of Congo! 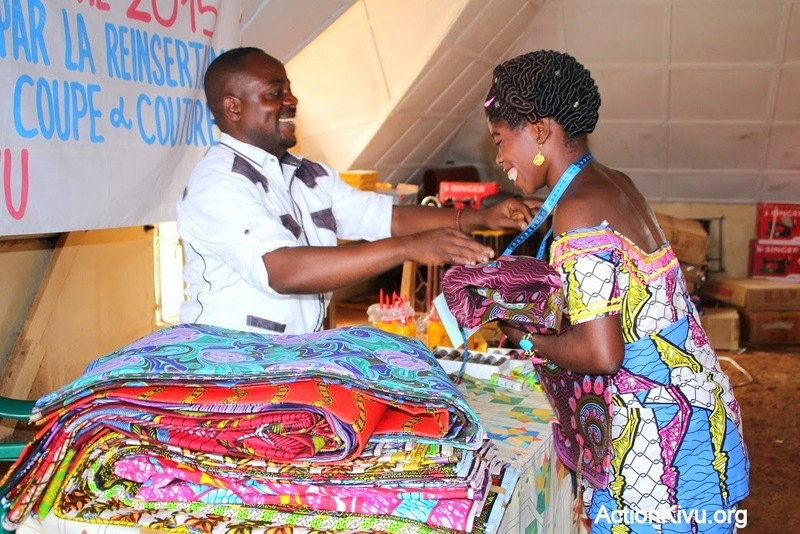 “The women from the Action Kivu sewing center also came out to meet us and asked that we carry their message of triumph and hope back tothe U.S. What they were most looking forward to was the completion of Amani’s ongoing project–the Peace Market. “Mumosho is a small village located about 16 miles from Bukavu, situated right on the border with Rwanda, which means it is 16 miles away from the nearest market. Therefore, the women of Mumosho were forced to walk for hours to purchase basic goods, including food, soap, and clothing. And during their trek through the forest, they were vulnerable to attacks from the roving militias, including the FDLR. As a result, many women simply did not make the journey for fear of being raped or shot, and the community in turn suffered. Later learning of the need for latrines at the Peace Market, essential to prevent an outbreak of cholera, Robin promptly donated the funds needed to build the toilets. Her compassion and generosity have made an indelible mark in the lives of the women and children in eastern Congo. And she continues to do so, through this beautiful line of sleepwear, and invites you to make a difference, too. Visit plfdreams.com to learn more about the pajamas and to purchase. 100% of profits are going to Action Kivu and Synergie Des Femmes, to support the women of Congo! Meet Amani, community builder, leader, and visionary! Watch the video to experience his corner of Congo here. Read more from Robin Wright and JD Stier about meeting Amani and the women of Mumosho’s Sewing Workshop here! And if you’ve yet to meet Amani via Enough Project’s video series, I am Congo – watch now, and spread the message of hope!